Brown Ogee guttering offers quality at affordable prices, it looks good can handle a lot of water and lasts for years. A traditional ogee style profile. One of the highest capacity PVC-U domestic rainwater systems on the market. Can be connected to either square or round downpipes. Revolutionary designed moulded water-tight seal and retaining clip, pre-fitted for fast user-friendly installation. Ogee can enhance the decorative appeal of all properties, both new and old. Full range of fittings and adapters available. Description: 4m length Niagara guttering Brown Manufacturer : Floplast Colour : Brown Niagara® Rainwater System System Features: A traditional ogee style profile. One of the highest capacity PVC-U domestic rainwater systems on the market. Revolutionary designed moulded .. Description: 65mm Gloss Brown Square 2.5 m long downpipe fits straight onto fittings. Colour: Brown Dimensions: 65mm Square x 2.5m Long .. Description: 4m Mahogany Effect Ogee Niagara Gutter Manufacturer: Floplast Colour: Mahogany Woodgrain Effect Finish Woodgrain Rainwater Sytems come with a 10year manufacturers Performance and Colour Guarantee. Authentic Mahogany Look. Ideally suited for conservatories, bun.. Description: Niagara Running Outlet Manufacturer : Colour : Brown Niagara® Rainwater System System Features: A traditional ogee style profile. One of the highest capacity PVC-U domestic rainwater systems on the market. Revolutionary designed moulded wate.. Description : 65mm Gloss Brown Square 4 m downpipe fits straight onto fittings. Manufacturer : Colour : Brown Dimension : 65mm Square x 4m Long .. Description: 90º Mahogany Ogee Niagara External Gutter Angle Manufacturer: Floplast Colour: Mahogany Woodgrain Effect Finish Woodgrain Rainwater Sytems come with a 10year manufacturers Performance and Colour Guarantee. Authentic Mahogany Look. Ideally suited for conservato.. Description: 90º Mahogany Ogee Niagara Internal Gutter Angle Manufacturer: Floplast Colour: Mahogany Woodgrain Effect Finish Woodgrain Rainwater Sytems come with a 10year manufacturers Performance and Colour Guarantee. Authentic Mahogany Look. Ideally suited for conservato.. Description: Niagara Stop End Handed Please select Left/right hand looking from front Manufacturer : Colour : Brown Niagara® Rainwater System System Features: A traditional ogee style profile. One of the highest capacity PVC-U domestic rainwater systems o.. Description: 135º Mahogany Ogee Niagara External Gutter Angle Manufacturer: Floplast Colour: Mahogany Woodgrain Effect Finish Woodgrain Rainwater Sytems come with a 10year manufacturers Performance and Colour Guarantee. Authentic Mahogany Look. Ideally suited for conservat.. Description: 135 Degree Mahogany Ogee Niagara Internal Gutter Angle Manufacturer: Floplast Colour: Mahogany Woodgrain Effect Finish Woodgrain Rainwater Sytems come with a 10year manufacturers Performance and Colour Guarantee. Authentic Mahogany Look. Id.. Description: Niagara Internal Stop End Handed Please select Left/right hand looking from front Manufacturer : Floplast Colour : Brown Niagara® Rainwater System System Features: A traditional ogee style profile. One of the highest capacity PVC-U domestic rainwate.. Description: Mahogany Ogee Niagara External Gutter Stop End - Left Hand Manufacturer: Floplast Colour: Mahogany Woodgrain Effect Finish Woodgrain Rainwater Sytems come with a 10year manufacturers Performance and Colour Guarantee. Authentic Mahogany Look. Ideally suited for.. Description : Niagara Stop End Outlet Please select Left/right hand looking from front Manufacturer: Colour : Brown Niagara® Rainwater System System Features: A traditional ogee style profile. One of the highest capacity PVC-U domestic rainwater systems on the mar.. Description: Mahogany Ogee Niagara Internal Gutter Stop End - Left Hand Manufacturer: Floplast Colour: Mahogany Woodgrain Effect Finish Woodgrain Rainwater Sytems come with a 10year manufacturers Performance and Colour Guarantee. Authentic Mahogany Look. Ideally suited for.. Description: Mahogany Ogee Niagara Internal Gutter Stop End - Right Hand Manufacturer: Floplast Colour: Mahogany Woodgrain Effect Finish Woodgrain Rainwater Sytems come with a 10year manufacturers Performance and Colour Guarantee. Authentic Mahogany Look. Ideally suited fo.. Description: Niagara Union/Joint Manufacturer : Floplast Colour : Brown Niagara® Rainwater System System Features: A traditional ogee style profile. One of the highest capacity PVC-U domestic rainwater systems on the market. Revolutionary designed moulded wate.. 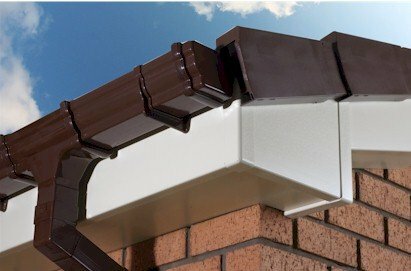 Description: Niagara fascia bracket fix at 800 mm centres Manufacturer : Floplast Colour : Plain Brown Niagara® Rainwater System System Features: A traditional ogee style profile. One of the highest capacity PVC-U domestic rainwater systems on the market. Revolutio.. Description: Mahogany Ogee Niagara Gutter Running Outlet Manufacturer: Floplast Colour: Mahogany Woodgrain Effect Finish Woodgrain Rainwater Sytems come with a 10year manufacturers Performance and Colour Guarantee. Authentic Mahogany Look. Ideally suited for conservatories.. Description: 90 Degree angles internal and external please select Manufacturer : Floplast Colour : Brown Niagara® Rainwater System System Features: A traditional ogee style profile. One of the highest capacity PVC-U domestic rainwater systems on the market. Re.. Description: Mahogany Ogee Niagara Gutter Stopend Outlet - Left Hand Manufacturer: Floplast Colour: Mahogany Woodgrain Effect Finish Woodgrain Rainwater Sytems come with a 10year manufacturers Performance and Colour Guarantee. Authentic Mahogany Look. Ideally suited for co.. Description: Mahogany Ogee Niagara Gutter Stopend Outlet - Right Hand Manufacturer: Floplast Colour: Mahogany Woodgrain Effect Finish Woodgrain Rainwater Sytems come with a 10year manufacturers Performance and Colour Guarantee. Authentic Mahogany Look. Ideally suited for c.. Description: 135 Degree angles internal and external please select Manufacturer : Floplast Colour : Brown Niagara® Rainwater System System Features: A traditional ogee style profile. One of the highest capacity PVC-U domestic rainwater systems on the marke.. Description: Mahogany Ogee Niagara Gutter Union Bracket Manufacturer: Floplast Colour: Mahogany Woodgrain Effect Finish Woodgrain Rainwater Sytems come with a 10year manufacturers Performance and Colour Guarantee. Authentic Mahogany Look. Ideally suited for conservatories,.. Description Niagara To 1/2 Round converter Please select left/right hand looking from front Picture shows Niagara to Sq, Niagara to round supplied Manufacturer : Floplast Colour : Brown Niagara® Rainwater System System Features: A traditional ogee .. Description Niagara Brown - Niagara To Square Converter Please select left/right hand looking from front Picture shows Niagara to Sq, Niagara to round supplied Manufacturer : Floplast Colour : Brown Niagara® Rainwater System System Features: .. Description: Gloss Brown Universal hopper head fits 65mm square or 68mm round downpipes. With two pre-formed fixing points to allow easy installation. Maximum flow rate 1.14 liters/second. Colour: Brown Want to order by telephone. We are here to help. .. Description: 68mm Gloss Brown 4m Downpipe, fits straight into fittings. Colour: Brown Dimensions: 68mm Diameter x 4m Length Want to order by telephone. We are here to help. Please call 01179719922 Weekdays 8 am - 4.30 pm We deliver nationwide normal del.. Description : 65mm Gloss Brown Square down pipe joiner for use with Floplast 65mm Square Downpipe. Manufacturer : Colour : Brown .. Description : 112º offset downpipe bend for use with 65mm square downpipes. Normally bought in pairs and used to bring the downpipe from the running outlet in towards a wall and then back to a vertical postion. Manufacturer : Colour : Brown .. Description : 68mm Gloss Brown 2.5m long Downpipe, fits straight into fixings Colour : Brown Dimensions : 68mm Diameter x 2.5m Length ​ Want to order by telephone. We are here to help. Please call 01179719922 Weekdays 8 am - 4.30 pm We deliver nationwide .. Description : Gloss Brown Square 65 mm Downpipe stand off clip, for use with Floplast 65mm Square Downpipe. Manufacturer : Colour : Brown .. Description: 68mm Gloss Brown round downpipe joiner for use with Floplast 68mm Round Downpipe. Colour: Brown Want to order by telephone. We are here to help. Please call 01179719922 Weekdays 8 am - 4.30 pm We deliver nationwide normal delivery time 1-2 days for.. Description : 65mm Gloss Brown Square Downpipe 67.5º Branch, for use with 65mm Square Downpipes. Manufacturer : Colour : Brown .. Description: 112 degrees offset downpipe bend for use with 68mm downpipes. Normally bought in pairs and used to bring the downpipe from the running outlet in towards a wall and then back to a vertical position. Manufacturer : Colour: Brown Want to order.. Description : 65mm Gloss Brown Square downpipe shoe/spout for use with 65mm Square Downpipes. Manufacturer : Colour : Brown .. Description: Gloss Brown Round 68 mm Down pipe clip standoff, for use with 68mm Round Downpipe. Colour: Brown Want to order by telephone. We are here to help. Please call 01179719922 Weekdays 8 am - 4.30 pm We deliver nationwide normal delivery time 1-2 days for this pro.. Description : 65mm Gloss Brown Square 92.5 degree off set down pipe bend for use with 65mm Square downpipe. Manufacturer : Colour : Brown .. Description: 68mm Gloss Brown Round Downpipe 67.5º Branch, for use with 68mm Downpipes Colour: Brown Want to order by telephone. We are here to help. Please call 01179719922 Weekdays 8 am - 4.30 pm We deliver nationwide normal delivery time 1-2 days.. Description : 112 degree Adjustable offset downpipe bend for use with 65mm square downpipes. This two piece offset bend can be cut to size, marked in increments of 5mm, from 25m to 65mm. Allowing for variable distances between the running outlet and the downpipe agai.. Description: 68mm Gloss Brown Round 92.5 degree offset downpipe bend for use with the 68mm round downpipe. Colour: Brown Want to order by telephone. We are here to help. Please call 01179719922 Weekdays 8 am - 4.30 pm We deliver nationwide normal delivery time 1-2 d..